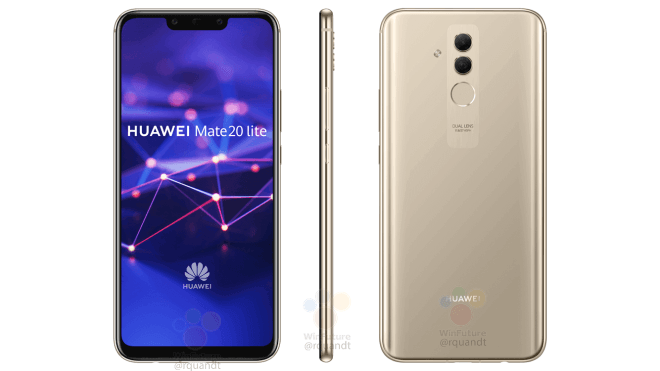 Chinese manufacturer Huawei is all set to launch a new smartphone in its Mate series, Huawei Mate 20 Lite was recently spotted on TENAA with a list of specifications and photos that surfaced on the web thanks to author Roland Quant on WinFuture. The upcoming Huawei Mate 20 Lite resembles recently launched Huawei Nova 3i or P Smart + although Mate 8 will belong to a premium middle class with price tag fetching around $400 as per sources. About Huawei Mate 20 Lite, Huawei has finally unveiled the notch on its phablets aka Mate series which is something Huawei and in fact, every other smartphone manufacturer has been trying to employ in their smartphones except Samsung and few others. The Mate 20 Lite features a 6.3” IPS LCD display featuring 1080 x 2340 pixel resolution and an aspect ratio of 19.5:9. Further, the dimensions as studied by GSMArena reveals that it will have 158.3 x 75.3 x 7.6mm making it literally slim and slicker than its predecessor. The images that recently surfaced concretized the slim stature of Mate 20 Lite that looks extremely premium. The dual-camera setup in the rear is a 20MP+2MP depth sensor which is vertically placed and aligned with a fingerprint scanner much like Samsung Galaxy Note 9. The main sensor has an aperture of f/1.8 that looks like a premium feature in a middle segment smartphone. Huawei has given a touch of excellence by treating a stripe with a fingerprint scanner and rear camera set up in a fancy stripe that looks flawless and attractive. Similar to scaled down version P20 Pro i.e. P20 Lite, the Huawei Mate 20 Lite brings a dual-camera setup at the front with a 24MP + 2MP depth sensor. It can shot 1080p@30fps as per what we know for now but there’s more to it that we will get to know as and when the Huawei Mate 20 Lite officially launches this month. The phone is backed by a massive 3,650mAh battery which is bigger in capacity than OnePlus 6’ 3,300mAh battery. It has a front and back glass with metal frames and everything crammed in a chassis which is just 7.6mm thick or say, think. Under the hood, the phablet will get a HiSilicon Kirin 710 octa-core SoC made by TMSC’s 12nm manufacturing process with four 2.2 GHz Cortex-A73 cores and four 1.7 GHz ARM Cortex-A53 cores giving a significant boost than Kiri 659 although it won’t match up with the capabilities of Kirin 970 AI SoC which comes with Huawei Honor Play. It will sport 6 gigs of RAM and a 64GB internal storage, however, it may or may not have a microSD slot as it is up for dispute until Huawei declared about it officially. As per few sources, the phablet is expected to cost around $400 and will go for sale by the end of August 2018. We have seen Mate 20 Lite in Gold and Black color variant but there could be more variant available. Tags: AndroidHuawei Mate 20 LiteHuawei.